The 2018 Ram 2500 will be the last big truck you can buy with a manual transmission. Ram’s three-pedal option is going away for 2019, and every other brand abandoned stick shift for its full-sized trucks a long time ago. It’s not surprising, but it’s still sad. 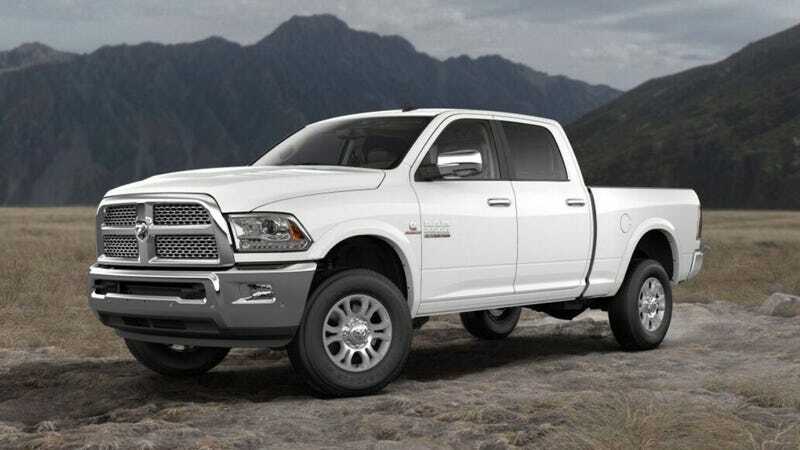 As of right now, you can order a new Ram 2500 with a 6.7-liter inline six-cylinder Cummins diesel engine and a G56 six-speed manual transmission. You can even pair that powertrain with four-wheel drive and the medium-luxury Laramie trim. I don’t care what anybody’s payload and towing max claims are, to me, what I just described has been King Of The Trucks for as long as it has existed. So while I’m sure the flatbrim folks are already sore from fist bumping over Ram’s “1000 lb-ft of torque” claim announced today, I will solemnly pour out a little diesel on the deck tonight for the death of the stick shift sovereign. Manual transmissions have not been common in full-sized trucks like the Ford F-Series and such since the 1980s. Well, they’ve never really been common in America since automatics were invented, but relatively speaking. You could spec most trucks with a stick until the ’90s when they basically got relegated to being paired with small engine options as the “cheap” choice in a brand’s lineup, and over the last 10 years they essentially disappeared altogether. Today, the mid-sized Toyota Tacoma and Nissan Frontier can still both be ordered with a manual transmission, their top engine and four-wheel-drive. Even the mighty 2019 Tacoma TRD Pro can be bought with a stick, as well as the less extreme and much less expensive 2019 Frontier PRO-4X. You can have the smaller 2019 Chevy Colorado with a manual too, but only in the ultra-lean 2WD four-cylinder base model. That makes the herd of trucks you can buy stateside, with a stick, pretty darn thin. So I guess if you have $60,000 to spend on a truck right now, you’d be smart to buy a 2018 Ram 2500 manual because you’ll probably be able to resell it for its weight in gold in a few years. If you want evidence of that, check out what a 10-year-old Cummins manual 4x4 with 250,000 miles costs today. If you can find one... it’s a lot.